The 61 Mechanised Battalion Group Veterans Association was created to immortalise the deeds, sacrifices, adventures and stories of this South African Defence Force military unit. The 61 Mech Battalion Group Veterans Association acts as a forum through which former members of this battle force can share their memories and accounts of events that transpired during their service with the unit. 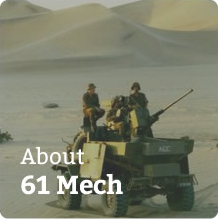 This website, specifically, serves the memory of 61 Mech as well as you, the past member, the men who are proud to have served as part of such a distinguished and unique unit and who want to share their experiences with others who can relate and understand what it really meant to have served with 61 Mech. 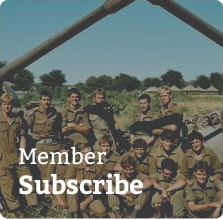 You are invited to subscribe as a member of the 61 Mechanised Battalion Group Veterans Association, to share your stories and step into yesterday with us, lay old ghosts to rest and maybe relive some treasured moments. 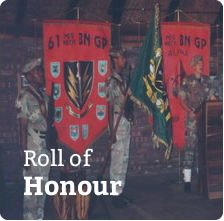 The 61 Mech Veterans Association acknowledges the fact that the former SADF served the government of the time, in its capacity as an armed force. 61 Mechanised Battalion Group, likewise, served that government and was eventually dissolved in 2005 by the current government. We would like to point out that this site is strictly to bring together those who have served with 61 Mech, their next of kin and families, to share experiences and memories, and this is not a platform from which to voice political views. If you discover any mistakes or inaccuracies reflected on this website, please bring it to our attention that we can update our records to reflect the correct facts.